New ice with a clear, bluish color is stronger and safer than older ice with a cloudy, milky appearance. Avoid cracked, refrozen ice or ice with pockmarks, slush or other signs of melting. Snow insulates ice and can keep it warmer than the air temperature. Avoid walking on ice that is heavily snow-covered since ice damage cannot be seen. The thickness and strength of ice can vary even on the same body of water and under the same conditions. Always test ice frequently to be sure it is safe. Ice is weaker when it forms over flowing water and currents, including near where streams or rivers join, near bridge edges or adjacent to culverts. Avoid these areas entirely. Stay off ice entirely unless it is at least 4-5 inches thick. If you want to bring a vehicle on the ice, it must be at least 12-15 inches thick. Ask a local bait shop or similar facility about current ice conditions before heading out for ice fishing, but do not take their judgment as absolute – always test the ice yourself every few feet as you go. No ice is ever 100 percent safe, but if you better understand how to judge the condition of ice, you can pick the safest locations for ice fishing. When you have found a suitable location for ice fishing, there are many other safety steps to follow to be sure you don't run into danger on a frozen lake or river. Tell someone your ice fishing plans – where you plan to go, what route you will take, approximately how long you will be gone – so they can alert authorities if you don't return. Go ice fishing with a buddy or group rather than alone, but spread out over the ice so not to strain one single spot with too much weight and activity. Charge your cell phone before you leave, and keep it turned on at all times. Take along a radio and fresh batteries if you will be out of cell phone range. Dress in warm layers and have at least some clothing and gear in bright colors so it can easily be spotted if you are lost or rescue is needed. Bring along a change of dry clothes in a watertight bag in case your clothing gets wet. Dry clothes can help minimize the risk of hypothermia and frostbite. Wear cleats or crampons on the ice to ensure better footing and stability while walking. This will help minimize dangerous falls that can cause injuries or crack ice. Always wear a life vest or other floatation gear, and be sure it is properly rated to support your frame, build and weight. Carry handheld ice picks or claws in your pockets or attached to your belt to help pull yourself out of the water if you do break through the ice. Minimize the gear you take onto the ice. While you don't want to leave safety gear or necessary supplies behind, extra weight can put too much strain on the ice. Carry gear on a sled with a long pull rope rather than in a backpack or duffle to better distribute the weight across the ice and to avoid overexertion that can lead to exhaustion. If you will be using a heated shanty, be sure its equipment functions properly and that the interior is properly ventilated to avoid carbon monoxide poisoning. If you are taking a vehicle – a snowmobile, car, truck, ATV, etc. – onto the ice, drive much slower than normal to ensure safe braking distance if trouble is spotted ahead of your path. 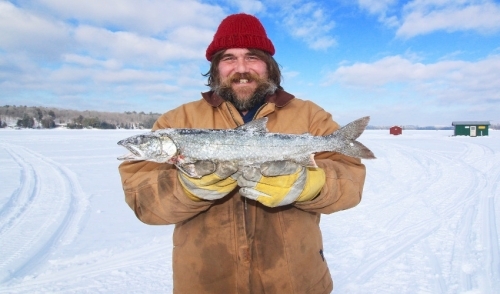 Ice fishing can be a great winter activity – make sure you do it safely!